When it comes to having a garden, space is not an issue. You can grow plants just about anywhere. So even if you live in a tiny apartment, you can grow some green. Why stop with pretty flowers? Consider growing your own herbs, fruits, and vegetables and really indulge your gardening senses. Getting started is the hard part, but it needn’t be intimidating. Start small. Give yourself a chance to master any problems before you have dozens of containers to care for. And start smart. Really access your site before you jump in. Size is not an issue, but things like sunlight, water access, and the sheer weight of your containers do need to be taken into consideration. Here’s how to start your urban garden off successfully. To grow lush and healthy, you have to give plants what they need. This needn’t be complicated, but there are some areas where you do not want to skimp. Sunlight - Most fruiting and flowering plants need a full day of sunshine. That means 6 - 8 hours of direct sun. This can be hard to come by in a city, where tall buildings on every side tend to block the sun for at least a part of the day. Balconies and rooftops stand the best chance of offering full sun. 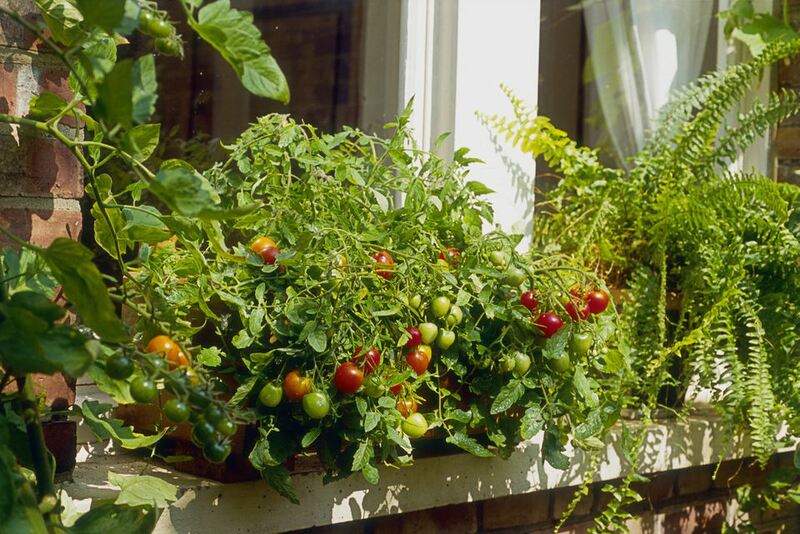 If you are gardening on a windowsill, you can either choose plants that can get by with less sunlight, like salad greens and some herbs, or you can add a grow light and not worry what the weather might bring. Soil - Plants depend on the soil they are planted in for water, air, and nutrients. Since your apartment garden will probably mean growing in containers, you cannot use ordinary garden soil. It will compact in pots, preventing water from flowing through and there will be no space for air. A good well-draining potting mix is necessary. A potting mix has several advantages. First, it is lighter and weight is an issue when you are gardening above the ground. It will be somewhat sterile, so you will not have to worry about diseases getting a free ride. And it remains fluffy so that there will be air pockets for the roots to access and water can flow freely. Water - Plants in containers need a lot of water, often several times a day. You want to be sure you choose a spot for your garden that has access to a water supply. Carrying watering cans up and down stairs can get tedious quickly. Consider purchasing a hose that can be attached to a sink faucet. It’s handy when you need it and it coils away when you don’t. Humidity - If you are growing your plants on an indoor windowsill, you will need to provide some extra humidity when the heat is on. Spritzing with a fine mist will help, or you can try placing a tray of water on a nearby radiator. Wind - If you are gardening several stories above ground or if you are by heavy traffic, you will need to consider the wind. Wind can tear through leaves and overturn top-heavy pots. Either provide a wind block or make sure your containers are wide enough to anchor your plants. Weight - Finally, keep in mind that containers full of soil are heavy, to begin with, and once they are saturated with water, their weight can triple. Make sure your garden spot can handle the weight. Window boxes will need to be secured to the window sill. If you are gardening on a balcony or rooftop, check with your landlord or building board about weight restrictions. You can grow just about anything in a container. A full-size apple tree might be out of the question, but there are skinny columnar varieties that can fit in a 1 ft. sq. corner of your balcony. Think about what you enjoy eating and then choose a few types of plants to try out. You can start with seeds, which offer more variety, but small plants will get your garden growing sooner. Herbs - Herbs are everyone’s first choice. While they do grow well in containers, they will not get as large and bushy as they would outdoors and you may have to replace them if you harvest frequently, but it is wonderful to have them close by when cooking. Some top choices include mint, chives, parsley, lavender, basil, and thyme. Salad greens - Salad favorites like lettuce, spinach, and arugula are quick growing, shallow-rooted plants. They can grow in less than ideal conditions, providing they get plenty of water. Tomatoes - Every vegetable gardener wants a homegrown tomato. Tomato plants can get large and heavy, but they grow well in pots. They will do best in a container that is at least 30 inches in diameter, but you can grow some of the patio varieties in a hanging basket. Chile Peppers - If you like heat, hot peppers grow very well in confinement. Indoors or out, they can set fruits year round. Hot peppers do better than sweet peppers in containers. Meyer Lemon - Some of the easiest fruits to grow in a container are dwarf citrus trees. Meyer lemons do very well indoors if they get 6 - 8 hours of sun and some humidity. Put something underneath the pot to protect your floors and furniture. Lemon trees give off a sticky sap. Strawberries - A window box of strawberries is as beautiful as it is delicious. They will need at least 6 hours of sun and 12 inches of soil. Watering - By far the most important gardening task will be watering. Even if your garden is exposed to rain, it probably will not be enough water. The soil in containers dries out quickly. The warmer the weather and the more the plant roots fill out, the quicker your containers will dry out. Test the soil by poking your finger an inch or two below the soil surface. If it feels dry, you need to water. Feeding - Unless you bought a potting mix that contains fertilizer, you will need to feed your plants on a regular schedule. A water-soluble fertilizer that can be added when you water is usually easiest. Plan on feeding them every other week or whatever is recommended on the fertilizer label. Problems - Pests and diseases have a way of finding plants no matter where you grow them and there are no natural predators for insects indoors. Monitor your plants whenever you water them or harvest. Catch problems early. If you see a problem, move that plant away from the other plants until the problem is remedied. Harvesting - It may sound counterintuitive, but many small space gardeners have a hard time harvesting their vegetables. They like to see the abundance. However, the more you harvest, the more fruit will set, so don’t be shy. Apartments don’t always offer vast amounts of space to indulge in gardening, but there is bound to be a sunny corner or two where you can test your green thumb and enjoy the fruits of your labor.